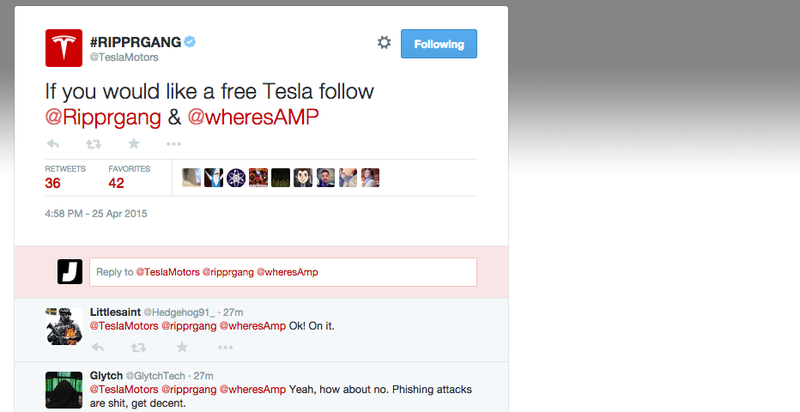 Tesla Motors may be on top of the security protocols necessary to keep their cars safe, but apparently no one there instituted enough controls to keep their Twitter account from getting hacked. Oops. And they’ve taken to pretending to be, I’m guessing, some unlucky Internet foe or ex-girlfriend from Illinois who now has had their information put on blast for the world to see. Two-step authorization may not have helped Tesla, but it probably couldn’t have hurt.